Johan Julius Exner was an extremely successful and popular Danish genre painter who began his training in 1839 at the Royal Danish Academy of Art. Later in his career, he studied under Christoffer Wilhelm Eckersberg, commonly referred to as the Father of Danish Painting. In his early years Exner exhibited several history paintings, as well as a number of portraits, earning him the Academy’s big and little silver medallions and the Academy’s Neuhausens prize. In 1849, the Danish Royal Painting Collection, now the Danish National Gallery, purchased one of his history paintings. Two years later, he was commissioned by Count Frederik Knuth to do a painting for the Knuthenborg Palace. The Count was generous with Exner, not only paying him well, but also providing him with a studio for several years. Exner began seeking out exotic rural farming communities in Denmark, which brought him to Amager, an island south of Copenhagen. While living in Amager, he painted “A Woman from Amager Counting Her Money,” which was exhibited in 1852 and later purchased by the National Collection. 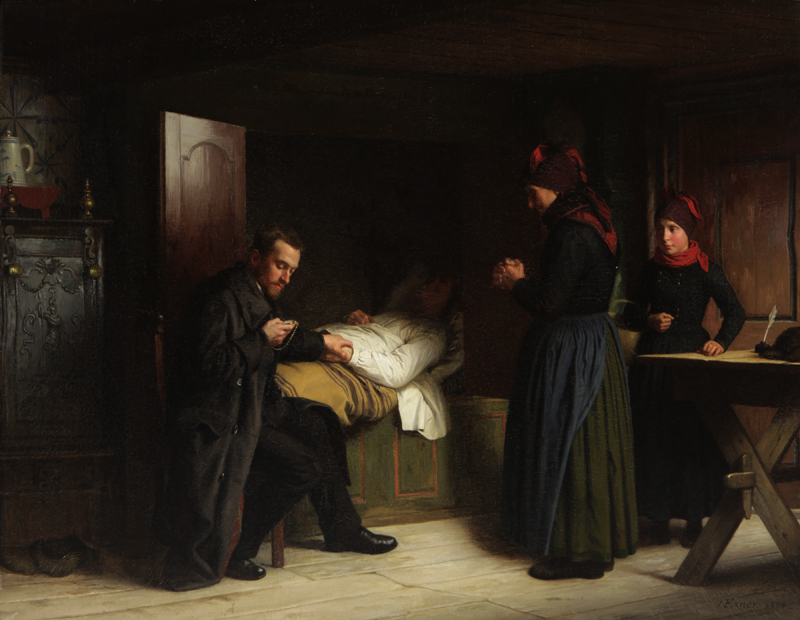 A follow up painting to his first Amager painting was “A Visit to Grandfather’s House,” painted in 1853. An enthusiastic public applauded the painting, guaranteeing him a successful and lucrative career with its widespread popularity and many reproductions. He won an exhibition medallion for the work, and the painting was purchased for the National Collection. He painted a number of other paintings depicting the people of Amager, portraying his subjects with affection, interest and gentle humor. In an age where industrialization was fast encroaching on traditional farm life, Exner depicted a timeless vision of several generations of farm folk. He received a two-year travel stipend from the Academy (1857–1858), which took him to Dresden, Vienna, Switzerland and Paris, in addition to the Italian cities of Venice, Parma, Florence, Naples and Rome. He also traveled to Sweden several times, and in 1866 he became a member of the Academy in Stockholm, Sweden. In 1864 he became a member of the Academy in Denmark, and was named Professor at the Danish Academy in 1876. He also had the great honor of having his work exhibited at the world exhibition in Paris in 1878. He died in Copenhagen in 1910, two weeks shy of his 85th birthday.